“Increasing Yield improvement” – this is a long-standing issue faced by component manufacturers. There are a number of factors that may affect the yield, and particularly, the chips produced during metal working have a large effect on the yield rate. Metal chips sometimes get entangled around components or tool edges, and this may lead to a stoppage of machines to remove the chips, and also chips may damage components and degrade their quality. The removal of chips is directly linked to a reduction in machining time and to the defect rate. 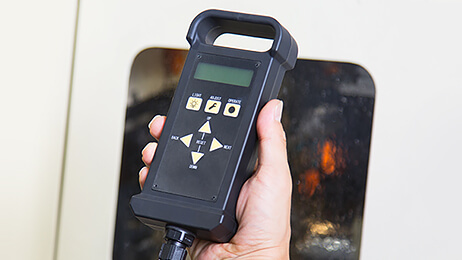 Thus, some machine tools have a device to remove chips by spraying oil from a nozzle, typically called a coolant. However, many conventional nozzles are of a fixed type, and they are not able to remove chips sufficiently. Also, the nozzle angle frequently needs to be manually adjusted depending on the material or processing method. Therefore, the chip removal rate and the effort of adjustment have been the issues to be resolved; especially for companies like Minebea, whose monthly mass-production volume exceeds a hundred million units of components. In such a case, a defect rate of 1% can equate to a million units of components, which proves to be very costly. As indicated by its name, “Wavy Nozzle” continuously injects a coolant at its target position via programmed actuation. The idea of guiding chips in one direction and preventing them from getting entangled, instead of blowing chips off by spraying a coolant at high pressure like conventional removal devices, was an unprecedented one. After installing the device on a trial basis in our process for producing hard disk components, significant results were achieved. The occurrence rate of defective items (defect rate), which had been around 1%, was improved to 0.02%. The shape and weight of chips vary depending on the details or raw materials of the cutting process. The movement of Wavy Nozzle can be selected from three modes so that it can support any machining work. Particularly, KICK mode is a function that can change the speed of the nozzle during reciprocation, which is unique to Minebea. The movement of the nozzle is controlled by using our stepping motor that offers accurate positional control. In addition, we have introduced a teaching play-back system in which we can move the nozzle manually while visually checking the situation using a dedicated controller, and then such movement can be stored on an electronic substrate of the device’s main body. The technologies fostered through our manufacturing of electronic devices have also been utilized in these functions. Normally, various components need to be developed and purchased to move the nozzle; however, Minebea, which produces a great variety of precision components in house, was able to realize a moving nozzle by combining existing products and newly developed dedicated substrates. Conventional chip-removal methods typically require injecting coolant at high pressure to blow off the chips. On the other hand, Wavy Nozzle, which “guides” chips, does not require high pressure coolant, nor does it require a compressor to be installed, thus saving space. It also contains a feature that allows it to be used for delicate precision machined components, as produced by Minebea and others, because of its low injection pressure. Moreover, because of its compact design, the unit does not require special equipment, and due to its superior versatility, can easily be installed on new or existing machinery. The intention of the compact design and high versatility was to target chip removal. However, after initially offering to the market, Minebea has received unearthed and unexpected multiple application uses outside of the initial scope from our customers. The product that is essential for oscillating the nozzle of Wavy Nozzle freely is Minebea’s stepping motor. A stepping motor, which offers accurate positional control, handles the following movement of the nozzle corresponding to the machining work. 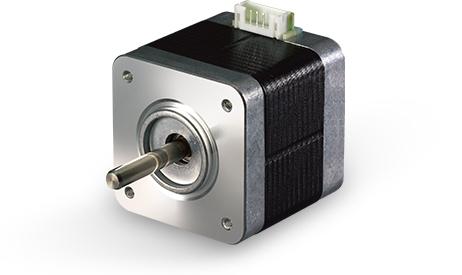 In addition, the motor enables the device to be operated at a fixed speed. Minimal acceleration and deceleration at the beginning of movement adds up to a smooth nozzle motion. It can be said that the stepping motor is one of the main keys to bringing about the realization of Wavy Nozzle. For the development of Wavy Nozzle, not only the stepping motor, but also a wide variety of our products and technologies have been introduced. A high in-house production rate of about 80% has been achieved by integrating the products and technologies of Minebea. 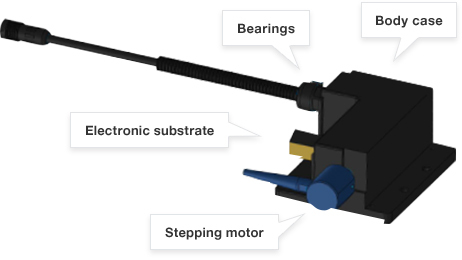 Resin-molding, one of the core technologies within Minebea, is used for the body case; the electronic substrate that controls complicated movement is produced in-house within our Electronic Devices Division; and our Bearing Division produces the ball bearings that support smooth and accurate motor movement.